As American industry grew, companies became increasingly separated from their customers. The old corner grocer knew his customers by sight. He greeted them by name when they came into his store. That is no longer possible for most American stores or businesses. They have thousands or millions of customers. They don’t know who they are and cannot provide recognition. Loyalty, as a result has gone out the window. In the last fifteen years, computers have come along and have become so sophisticated that it is possible today to store in a computer economically the kind of information that the old corner grocer used to keep in his head, and to use that information to provide recognition and build a relationship with individual customers. To provide substance to that relationship, in the 1980s, companies adopted the toll free customer service line. Millions of Americans called companies to ask questions. To support their customer service reps, companies built operational databases that gave the reps vital information about the company’s products, technical specifications, delivery status, etc. The pattern emerged that a customer service rep had a computer in front of her. As the calls came in, she manipulated the keys to bring the needed information on her screen, which she would read to the callers. Wow! LL Bean remembers! This is what the old corner grocers used to do. We can do it today. This is recognition. This builds a relationship. This brings back loyalty. How many companies are doing this today? Probably less than five percent, but the practice is growing, and it works. Customer service, however, is expensive. At a cost of $3 to $5 per call, with thousands of calls per day, companies have seen a significant drain on the bottom line. Customer lifetime value analysis must be used to determine whether the helpfulness and relationship building is worth the cost. In some cases, companies found that it was not paying its way. Most banks that have done profitability analysis have discovered that about half of their customers are unprofitable. A good part of the lack of profits can be traced to the expense of customer service. Federal Express provided a shining example of customer support by having customer reps that could field questions on the exact status of every package shipped at any time. A couple of years later, UPS set up a similar system. But these shining examples came at a significant cost. If every customer called to learn the status of their shipments, all shipments would cost at least $3 more than they do. When people look at e-commerce on the Internet, they complain that the value of the products sold directly on the web is still less than one percent of the value of products sold through other channels. They point out that few companies, including Amazon.com, are making profits from sales to consumers. This shortsighted criticism ignores the fact that the web is already a highly profitable medium for reducing the costs of customer service. What is happening is that the Internet is replacing the customer service rep. Instead of paying for a toll free call, and the cost of a customer service rep who is reading off of a computer screen, companies are learning that their customers can look at that same screen directly on the internet, and get the answers themselves. What’s more, customers like it better. When Sears Canada put their big book on the Internet, they found that 97% of the customers buying products on the web had the paper catalog in front of them. At the bottom of each page in the catalog is an 800 number. Customers preferred to click their orders on the web to calling a live operator. What is the saving to Sears Canada? About $4 per order. Banks are discovering the saving from the Internet. Transactions on the phone cost banks a dollar or more. Those on the web cost about a penny each. The big savings, however, come from inviting customers to come into our companies to read the same screens that our employees read. Customers become part of our company family. This is real relationship marketing. Picture the situation of a company meeting planner setting up a two-day seminar for about fifty customers. The planner is looking for a suitable hotel near Fort Lauderdale that has the facilities it wants at a cost that is within its budget. Let’s see what can be done by clicking on the Marriott.com web site. This is great marketing. 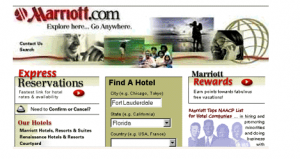 The Marriott web site was created in 1997. It provides information on 1,500 hotels whose annual revenue exceeds $10 billion. Think back to how you would have planned a meeting just two years ago in 1997 before all of this was available. You had to call Marriott, or other hotel chains on the phone. A customer service rep, looking at information similar to this on her computer screen would attempt to describe to you what she saw. She would offer to send you an expensive packet of information on hotels in the Fort Lauderdale area that would arrive a few days later. In the meantime you would probably have booked a hotel somewhere else. Your call would have cost Marriott at least $10, plus the cost of the fulfillment. Who is doing this? Customers use Dell Computer’s web site to check their order status 50,000 times per week. The same calls to Dell’s customer service reps cost Dell $200,000 per week. Dell also saves several million dollars per year by encouraging 200,000 customers per week to make their trouble shooting inquiries through the web. But Dell is doing something else. They have created more than 20,000 Premier Pages for individual companies. Each page displays standard machine configurations and prices that have been negotiated in advance with the company management. A secure page linked to the Premier page with a password provides account information for senior purchasing managers of the company so that they can track their company’s acquisition of computers. So, when you hear people talking about how no one is making money on the web, think again. They may be right. But what is happening is that hundreds of companies are saving moneyand building customer relationships on the web. In the long run, these two functions will be more important than the total amount of direct sales to new people.